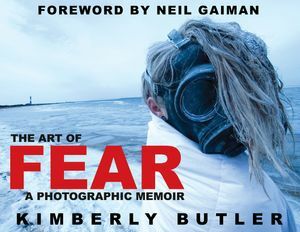 (NEW YORK/April 26, 2019) - Photojournalist and celebrity photographer Kimberly Butler has published her first book, “The Art of Fear: A Photographic Memoir” (Sky Perspectives Publishing, US/$29.95), an epic poem featuring 34 exquisite yet disturbing images – without using Photoshop -- where she faces her fears to reveal the childhood trauma she experienced when, at 8 years old, she was removed from her home and placed in Ottilie Orphan Home in Jamaica, New York. The young woman posing in the photographs wearing a gas mask – a metaphor for the protective walls Butler built around her life – is her own daughter, Caitlin, whom she adopted from a Lithuanian orphanage – coincidentally – at the age of 8 years old. The locations for the photographs in this 104-page softcover book include a collapsed abandoned building, a deserted icy beach during winter, and an empty church and cemetery – each representing the loneliness, isolation, and fear she fought to overcome by using masks to cloak feelings of shame and worthlessness. Kimberly Butler has photographed hundreds of celebrities and world leaders including five U.S. presidents. Her credits include covers of New York Times best sellers and gallery shoots for major broadcast networks. She was also a regular contributor to PEOPLE magazine for more than a decade. Butler has traveled extensively in the Middle East and the former Soviet Union as a photojournalist and documentary filmmaker in Jordan, Jerusalem, Gaza, and Chechnya. For the past two decades she has been the creative force behind the American Library Association’s Celebrity READ poster series, exhibited nationwide in public schools and libraries. In 2018 she exhibited her photographic series on banned books in NY called “CENSORED.” Butler is a native New Yorker and lives in Manhattan.